Come with me and watch me do a live demonstration of a home visit at one of my celebrity client's house. Take advantage of this rare opportunity to not only learn and observe but also meet one of my celebrities. This requires students to complete the Basic Course and hands-on course before going on this appointment. This also requires a 3rd day of training. This Hollywood Airbrush Tanning Salon course is an online, self-paced eLearning course. This course has many different video lessons which consists of 4 hours of training. These are topics and issues you need to know before working at the Hollywood Airbrush Tanning Salon and it will help you understand the magic behind matching formulas to different skin types. In this course you are learning my best tips, tricks and trade secrets on how to find clients right away and get your business up and running quickly without having to spend money in advertising. You will learn how to position yourself all over the internet and learn about the many great tools I use to market myself. Because of this course, my students know how to get lot's of clients right away. 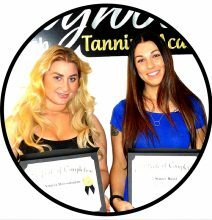 This course is for the Hollywood Airbrush Tanning Academy's certified airbrush tanning technicians who want to advance or become a trainer after at least 3 month of spray tanning. It requires either an in person spray tan in front of a trainer or a video needs to be sent on you spray tanning a person. This course or video lessons are for those students who can not come to the hands-on training and want to learn online. The Basic Airbrush Tanning Course and Graduate Airbrush Tanning Course are included. It also includes many hours of live video conference training with a trainer. In this course I trained a new student live in front of the camera and we video taped everything. This course also includes all the topics of the Basic Airbrush Tanning Certification Course and the Graduate Airbrush Tanning Training Course. Learn on your own and at your own speed. This course is only for those students who have already completed the Basic Airbrush Tanning Course and the hands-on airbrush tanning classes at the Hollywood Airbrush Tanning Academy. In this course you will receive all the reminder videos about the spray tanning routine, order forms for supplies, machines and many other things to market your business. This Basic Airbrush Tanning Certification course is an online, self-paced eLearning course. This course has many different video lessons which consists of 4 hours of training. These are topics and issues you need to know in order to start your own airbrush tanning business and will help you understand the magic behind matching formulas to different skin types. Comprehensive 1 day or 2 half-days hands-on training with 3-4 real models using a variety of real spray tanning solution. Supplies and solution for the training is included. You get access to 4 hours of online video training before attending the hands-on training covering everything from skin types, education on a variety of spray tanning solution, bodybuilder spray tanning and so much more. 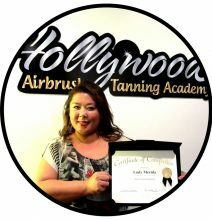 You will receive a beautiful certificate and a golden Hollywood Airbrush Tanning Academy pin to wear on your shirt plus verified digital credentials to be used in emails, website, social media linking back to the Hollywood Airbrush Tanning Academy website. We book all the models with different skin types and many of them are real talented models or actors – there is nothing you have to organize or bring to class. Receive a comprehensive list of all the suppliers where you purchase the solutions and supplies directly at negotiated student discount. We refer you directly and do not sell you anything and this alone is a huge saving. Learn from experts who actually Do what they teach everyday!